This delightful story, filled with colorful illustrations, is designed to be read by parents and their adopted children with one goal in mind: to show them just how special and loved they are. Your child will realize that while your family is "different," it is a family built on love both from the birth mother who gave them up for adoption and the adoptive family who chose them. Perfect for children ages 3 and up. Every child is special. And every child deserves to be recognized for what makes him or her unique. 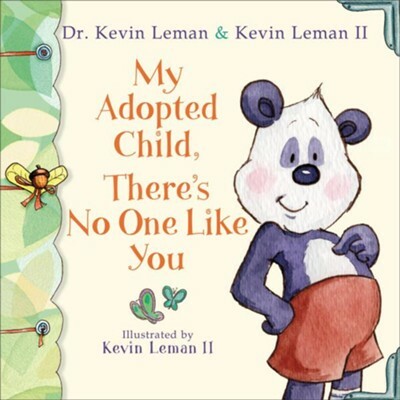 Now birth order guru, Dr. Kevin Leman, and his artist son, Kevin Leman II, offer parents the perfect way to tell their adopted child just how wonderful he or she is. A read-to-me children's picture book, My Adopted Child, There's No One Like You conveys love, acceptance, and a sense of individuality to adopted children. The combination of Dr. Kevin Leman's trademark humor and his talented son's artwork makes this book a wonderful gift. Dr. Kevin Leman is an internationally known psychologist, humorist, and best-selling author. He is former consulting psychologist for Good Morning America and a frequent guest on The View, The Early Show, and Focus on the Family. He and his wife, Sande, live in Tucson, Arizona. They have five children. Kevin Leman II graduated with honors from the Ringling School of Art and Design in Sarasota, Florida. Since then he has worked with NBC, Intel, and Disney, and he is an Emmy award-winning writer for the funniest show on daytime television. He lives in Burbank, California. I'm the author/artist and I want to review My Adopted Child, There's No One Like You - eBook.